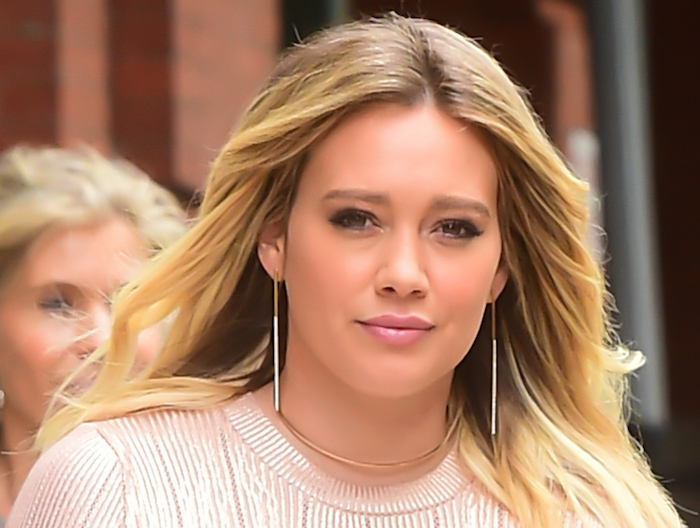 Hilary Duff’s street style is a thing of beauty, and this week she is showing us how to gracefully make the transition into fall clothes that aren’t too heavy, and happen to just be perfect to wear to the office! Hilary’s been rocking the wide-leg pant for a while now, and with good reason! It’s a flattering cut that is comfortable but still looks tailored and and stylish. Paired with a soft pink sweater, it’s the perfect blend of edgy and classic! The slight sheen and the ribbed texture of the sweater make it more interesting than your average pullover, and the sweet pink color balances the pants so it doesn’t feel too heavy. The white high heels are the most unexpected component of the outfit, bringing a lightness to the ensemble with a nod to the fact that the seasons are still in flux! This outfit would look killer in the office — professional and put together, while remaining cool and comfy. 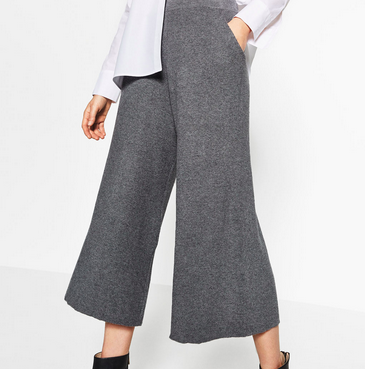 Zara’s Ribbed Trousers look both high end and super cozy all at once. Everlane’s Silk Long-Sleeved Tee is a perf choice. This $88 top is a beautiful soft color and simple shape, but is elevated by the silk fabric for the perfect contrast. Asos New Look Leather Sandals in white complete the look. Snag them for $56.41 to complete the look! And hey, let’s not forget about that bag! 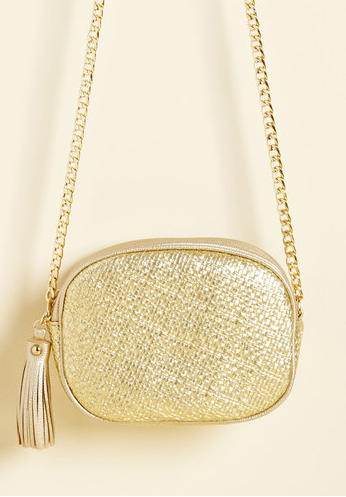 This gold Modcloth bag makes a statement without overwhelming the whole outfit. Get it for $39.99, here. We can always count on Hilary to look fabulous, and this look is no exception. All of these pieces would look incredible mixed and matched with other pieces, so they’re a perfect addition to your fall wardrobe! It’s all about multi-functionality, am I right?